The new Mike and the Bike was released this year and is available as a PDF. SALT LAKE CITY (April 27, 2016) – The new Sprint to the Finish Activity Book for elementary-aged children has been produced just in time for the final month of school across Utah and National Bike Month. This 18-page, full-color booklet was created by Larry H. Miller Tour of Utah and University of Utah Health Care. Illustrations from the popular Mike and The Bike children’s book series are used to share creative lessons on geography, nutrition and bicycle safety. Parents and teachers across the country are invited to download the Sprint to the Finish Activity Book and supporting educational documents from the Tour of Utah web site (Experience section). The booklet will be distributed this year at the Tour of Utah. 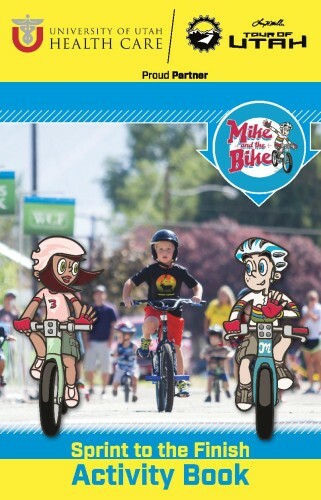 Throughout the activity book, young cyclists Mike and Lucille, from Mike and The Bike, offer children a guided tour of each stage of the professional bike race. Their story is complemented with interactive lesson plans. Three professional cyclists have contributed content this year to promote exercise and good nutrition — 2015 Tour of Utah defending champion Joe Dombrowski (Cannondale Pro Cycling Team), two-time Under-23 U.S. national champion and Utah native Tanner Putt (UnitedHealthcare Pro Cycling Team), and Top 10 finisher in the 2015 Tour of Utah and Utah native Rob Squire (Holowesko-Citadel Racing Team presented by Hincapie Sportswear). A downloadable version (PDF format) of the Sprint to the Finish Activity Book is available in English at https://www.tourofutah.com/about/mike-and-the-bike.